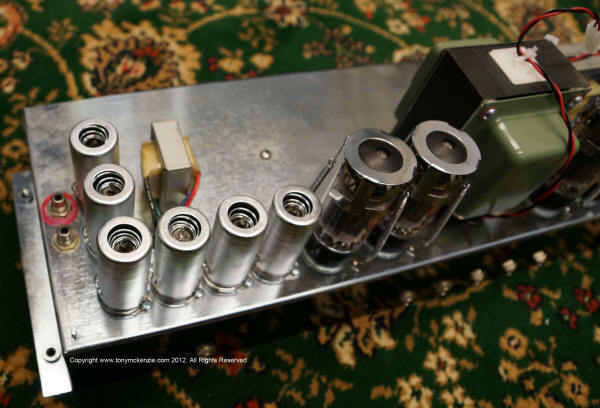 Divided by 13 is a well known tube amplifiermaker and their FTR-37 (FTR37) is reviewed here. Is this thing really worth the cost? And would I buy one? These Divided by 13 guys seem to have it all together; colors, tubes, old style tag board, big fat transformers and much more on offer. 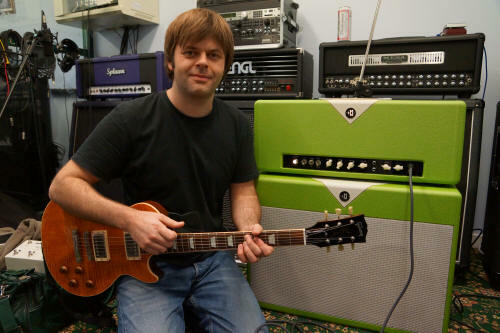 But at approaching £3500.00 or more for the amp and very special cab they should! This amp was kindly loaned to me by R&B Music, Crewe, Cheshire, United Kingdom by Dan Kelly who had this one made especially for himself. Dan is an old friend who I have known for a very long time and if Dan says the thing is cool then maybe it is, he's a bit of a connoisseur when it comes down to great tone. But everything is subjective. Anyway, if you want one of these then Dan can help you - he sells them and I don't sell anything so check the end of the review to find out Dan's details. He's a great guy and I'm sure he can do a deal for most guys. On to the amp under review the FTR-37 and it's matching cab. I always think of this amp like an old amp that's new (if that makes sense) and somehow, it has all those features that those old tube amps have (except for that green). Now I know that the owner liked the green color and each guy to his own I have no problem with that, but personally I could well have gotten the black spray paint out and... whoops... on second thoughts this amp is expensive and green or not it's probably better of as it was supplied. After all, it could have been near enough ANY color in a wide range of choices. 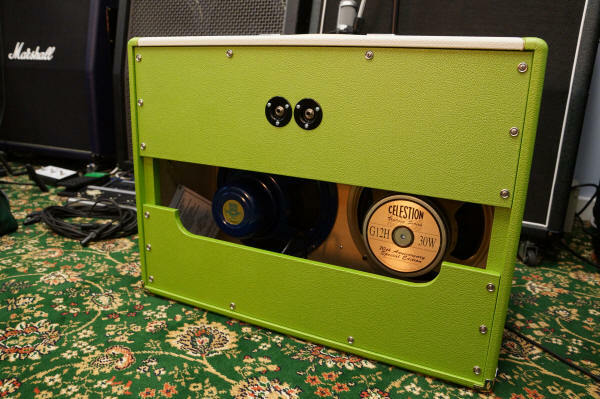 You see, this is one of those products that is hand built fro the ground up where quality is everything and options abound - and Divided by 13 know a thing or two about custom tube amps. "Capturing and exceeding some of the best tones offered by our favorite amp from Fullerton and our favorite amp from England, the FTR 37 from 1 to 10 can produce the most pure and bodied clean tones, to varying degrees of medium and over-the-top types of complex and full-bodied overdrive. Coupled with the exterior switching/boost device, the Switchazel, the flexibility available in both channels, either separate or blended, offer an infinite array of guitar tones rarely thought possible for the music maker of today." Head: 27.25W x 11.25H x 8D, 43Lbs. So, that's the plug out of the way (it's the least I could do - Dan loaned us the amp for review). This FTR37 actually is a simple amp. It (at least to me) is reminiscent of a JTM-45 style amp and while the actual circuit may well be different in a number of ways, there's also this sort of 'dejavu' feeling about this amp. 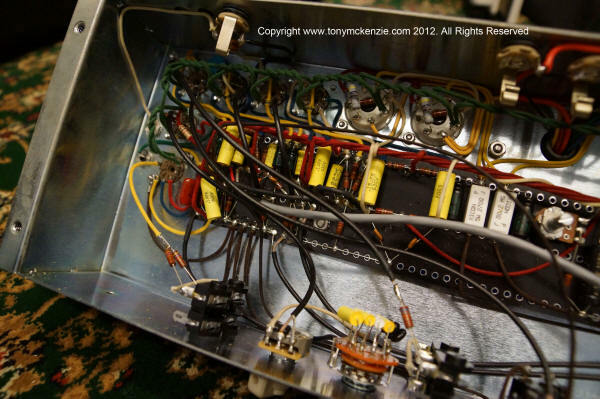 And inside its simple too and that can be the making of a really great amp. As many regular visitors to this site will know, usually in a review of this kind I like to go 'inside' the unit under question, whether its a tube amp, a processor or indeed anything else I can get in to. One reason (as well as being inquisitive) is that there's nowhere to hide in there if you are a manufacturer and it will usually show the country of manufacture (as opposed to the box it comes in) or indeed exactly where the components come from. It's important in my view because something assembled in the USA (not particularly referring to this amp) is not quite the same as something MADE in the USA with all USA components. And some better quality close ups (click for larger images). As you can see from the above images the fact is that this amp is basically a modern derivative of the old point to point pcb that so many guys seem to like. They will tell you that they can 'hear' the sound difference, that the PCB is easier to fix and of course that this is the 'proper' way to make an amp. 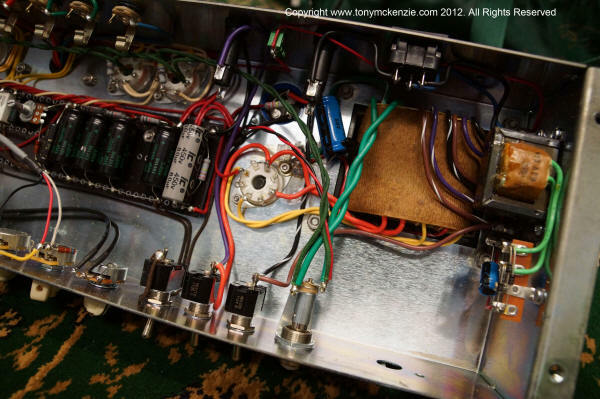 Looking closer, there is no doubt in my mind that this is a hand made amp (you can see the hand soldering and the extremely neat wiring around the tubes (unlike many Chinese made amps and even unlike some USA ones too). But this amp (at least to me) shouts out Marshall from the highest building around with maybe a smack of those old Fender amps thrown in for good measure. Quality components with real chokes and good old fashioned wiring and circuit designs I bet. Sort of like a 'tidied up' JTM-45! This is a nice little mod too - one of which I have seen many amp custom guys use including Lee Jackson amp modder to the stars you and I have heard of. Tone hounds indeed. Check out Lee Jacksons master series of videos for amp mods of Marshall amps and sure enough its all in there - very similar indeed. Anyhow, enough of that, I don't want to get you all killed especially if you don't know about that good stuff. So to conclude the inside section: This amplifier is primarily made to exacting standards of the highest degree and likely built on tried and tested 'old school' amplifier designs but boosted with a number of modifications in that design such as extra preamp tubes, modified tone stacks, custom output and power transformers and probably some other things I have not examined too closely - but all to a great standard of build. Not a single piece of bad weld to be seen anywhere on this steel chassis which is coated similar to Marshall amps to stop it rusting over time. It's really nice to see an amplifier of this quality, and while there are many builders these days (seems to be a fad) this one does indeed stand out when you inspect it closely. The amp case is made from thick plywood in the tradition of these things and others and so is the matching cab. So it's not a fast buck chipboard or particle board pressed in some sweathouse in the far east. Actually I don't know the origin of the plywood so it could conceivably from a sweathouse making ply instead. Although looking at this amp I really don't think so. It's highly likely to be good old USA or Canada maybe as an origin for the Ply. Simple things like the handle is durable and appears to be leather (they probably are at this price) and the overall feel is of quality from every angle including underneath the amp believe it or not. There are many color options for this amp as you will have seen from the swatches further back in this review so if you don't like puke green as I don't - I spilled the Bud on it in the video (jokingly of course) then there are some fine choices available such as the purple or green that is more to my taste - or maybe that dual tome of grey and orange, that looks cool too. The brand logo is placed in the middle top of this amp head and has a nice warm glow when the amp is turned on. That's just aesthetics, because when this amp is turned on trust me on this you will know it. For your information the amp cab (which is optional) comes with an open back and a closed back - so you simply swap out the back to the one that sounds best to you and hey presto - a different sounding amp. That's a really nice touch, it won't cost the maker much to do it, and the benefits to the user are great. A shot showing the speaker arrangement for the cab - a Celestion G12H 30w and a Celestion G12 'blue' just like the amps of the old days. By mixing two different speakers in this way the effect on the tone will be dramatic - as will closing off that hole you see the speakers through. Like I said, Divided by 13 supply the alternative cab back with the unit for free. Although there is a specification above and most of it is covered in there I just want to talk a little about the features of this amp and the benefits (or not) of this amp. Don't look for one. It's not there. So as a 'purists' amp right off the bat it hits the nerve points. Unfortunately (and just like the old amps or copycats or reissues) many guys want an effects loop in there. My JTM-45 is the same. While this could be a deal breaker for many guys, the fact is, that by design (or luck) this amp (and the JTM-45) works wonderfully with pedals slapped on the front end. So in fact you can get those sounds if you really want to add them all. But many guys who will use this amp I'm sure will want something like a TS808 (original, modded or hand wired - check my review for those on this site) to drive the amp nicely, great for rock. Other more laid back styles of music will use this amp as is. This amp features two 'channels' and while that's not really two channels as we know it, some of those preamp tubes can be switched in for the lead channel and it makes quite a difference. The company supplies a foot controller too so it can all be done from one place, which they refer to as 'Switchhazel' this pedal does indeed have another boost and can switch 'channels' in and out on various combinations. It's likely if you own this amp then you will be using this pedal. Don't look for MIDI - it's not there. So that rules all those MIDI controllers out? Right? Well, actually, wrong! I'm reviewing a Polish MIDI controller foot controller that does use midi, but it also uses SIX loops right in the pedal, there's power for each loop or pedal, MIDI control for other external processors and those 'loops' can be routed individually to even a rack as outboard effects. So fancy that, you could actually have full control over this amp (if that's what you want) with up to 100 presets where all or any loops could be switched in or out and you could control other devices with the MIDI. Now THAT'S flexibility. The 'Switchazel' pedal is OK and useful, it's just not as useful as that other pedal. 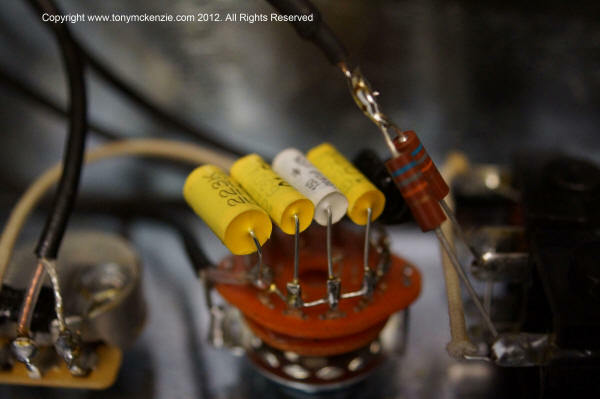 When I pulled this amp apart I noticed that the tube brand chosen by the manufacturer was JJ. These are well tried and tested and lots of guys use them. Some swear by them and others swear at them. Personally I think they are a good brand, but always remember with tubes that quality sometimes does waiver a little, and if you end up with some Chinese light bulbs :-) then remember that you will get what you pay for often with tubes. I showed this picture higher up the page, it looks like four capacitors stuck on a switch... and that's exactly what it is. By using the switch in circuit (in the driven channel) you can change the sound of the tone between any one of the four or completely remove the capacitor out of circuit. All this has an effect of giving the channel 5 different tones, which I would describe as gradually removing the top end (that's what the capacitor will do in this configuration) and to my ears making the sound more 'woolly' or less defined. But remember I play rock and like that treble (at least a little) so maybe I'm not the best guy to describe those tones. Or maybe I am if you play rock? In any case it's a tried and tested mod and will sound great to some tone hounds out there. The power section uses 4 x 6V6 GT giving on this amp 37 Watts output. My JTM-45 offers 30 Watts and while that amp is loud, you can actually run it flat out. This one is another story. This amp is different. There's a half power output switch on there to reduce the output to 18 Watts (thankfully). The preamp uses 12AX7 tubes (up to 6 of them) between two 'channels' and that's a well received mod for my money. Because if you have one of the 'old design' amps with just three tubes it's sometimes a bit of a pain to get them drive enough for that lead work. That's not the case here. This amp has a built in reverb tank of the old designs like accutronics (it might even be accutronics - I just did not want to disturb it in it's bag) and the sound is somewhat an acquired taste compared to today's digital stuff. The one thing I wan not too impressed with was the amount of reverb. Even backed off it was still apparent. The only way to completely get rid of the reverb was by fitting a switch in the reverb socket on the back of the amp and actually switching it off. Forget the pedal and you might well have to do this too. This is a nice sounding amp in real life, but you will notice (if you watch my video on this amp) that to record it with a video recorder could be a little difficult. Actually it can be really difficult! Why you might ask? The answer is that this amp is extremely loud. When Dan and I did the video of the amp we ran it on 18 Watts out through varying channels and ultimately flat out I wanted to leave the room. But at 37 Watts it could hurt your hearing! Really! This is a very loud amp and the claimed 37 Watts? Maybe it is, but my guess is that in this configuration it's higher output. It will blow your socks off, and your pants too; you have been warned. So don't think you're going to buy one of these FTR-37 amps and cabs and think that you are just going to do a little practice stint on your home or bedroom. You are not. So if you are not a giggling musician then I would seriously consider what I just said. You really have to trust me here - in the studio - I wanted to leave! The JTM-45 with it's 30 watts is bearable, but this FTR-37 is a wolf in sheep's (green) clothing (can you imagine that?) that will bite you if you get too near. In my opinion that's one reason why people like marshall are moving to the power reduction circuits in the latest amps so that they can actually use them at home. As you might imagine though, the sounds that you get from this thing are exceptional and they should be. The clean channel is exactly that. And while the gain channel is the obvious choice for lead guitar, you would be very surprised at the tones for lead guitar from the 'clean' channel especially if 'pushed' a little. For me, the reverb was not what I would personally use, it was cavernous, and even with it on minimum there was still output unless 'turned off'. The amp has the usual array of tone stack stuff; volume, treble bass reverb etc. while channel two has the 'click switch' and volume. The tone stack appears to be shared with the clean channel. For the connoisseur of older designs that wants that little extra this is the amp, although you will have to watch out for that massive volume. It's a pricy affair and for me would not be my choice of amp, but for may it could be. You will have to decide if the value is there for you, what with shipping, UK VAT and everything else Dan told me that the cost was over £3500 complete so I would have to really like this amp AND be a pro player to invest that much money in this amp. So my final score for this amp is about 7 out of 10 for the reasons stated above. That's not to say that this amp is not value for money, or that there's any quality issues there are not. If what you see here sounds good to you (check the video AND the one profiling the Kemper for a more accurate sound) then this could well be a great amp in your hands. And if you play AC/DC it's perfect! But then again so would be a Marshall Vintage style amp or three for this price! Many thanks to Dan Kelly who loaned the amp and cab personally, he sells these too and can be found on his website at: R&B Music Crewe Cheshire United Kingdom and I can recommend Dan as a fine guy that won't rip you off in any way. Check him out.